Mix together the ingredients for the salsa, adding the salt and pepper to taste. Leave to one side. In a shallow dish, mix together the olive oil, capers, lime zest and juice and pepper. Add the tuna steaks, cover and marinate in a refrigerator for 10 minutes. Heat a ridged grill pan or frying pan and cook the tuna steaks for 3-4 minutes each side. Place the tuna steaks on a plate and top with the salsa. 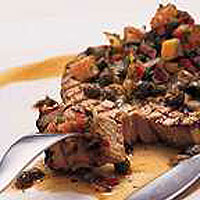 Serve tuna steaks with roasted vegetables and garlic mayonnaise or make tuna brochettes. Cut steaks into 2.5cm chunks, marinate in balsamic vinegar and olive oil, then thread the fish onto skewers and grill.